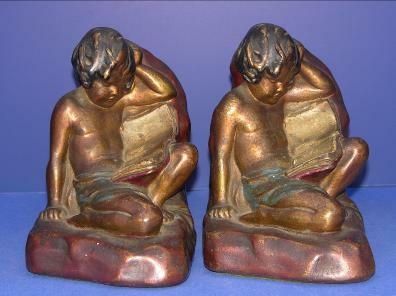 “Child Reading” by Armor Bronze, circa 1914. Bronze Clad, 6-1/2”, signed S. Morani (sculptor b.1879-1947). Polychrome. Paper label reads Armor Bronze, NYC. Imprinted Armor logo. Rarity 5 in Kuritzky’s Collectors Encyclopedia of Bookends, Plate 582, Page 107. Good condition. Some tarnish spots consistent with age.